Jennifer Baron joined Pittsburgh’s Saturday Light Brigade in 2009 and is responsible for underwriting, foundation and corporate relations, marketing and public relations for the radio production company. 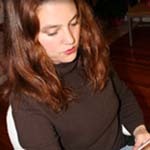 An accomplished writer, Jennifer also authors features and neighborhood guides for the weekly online magazine Pop City and is a co-author of Pittsburgh Signs Project: 250 Signs of Western Pennsylvania (Carnegie Mellon University Press, 2009). Ms. Baron also writes for Western Pennsylvania History Magazine, a publication of the Senator John Heinz Pittsburgh Regional History Center, and for Mt. Lebanon Magazine. From 2001-2006, Ms. Baron worked as Education Director at the Mattress Factory, where she developed, implemented and managed all aspects of the museum’s K-12, adult, youth, and family programming.